Abstract. The Arctic is a water-rich region, with freshwater systems covering about 16 % of the northern permafrost landscape. 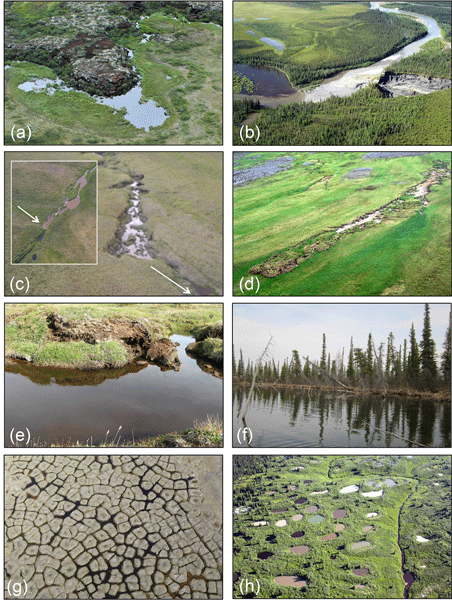 Permafrost thaw creates new freshwater ecosystems, while at the same time modifying the existing lakes, streams, and rivers that are impacted by thaw. Here, we describe the current state of knowledge regarding how permafrost thaw affects lentic (still) and lotic (moving) systems, exploring the effects of both thermokarst (thawing and collapse of ice-rich permafrost) and deepening of the active layer (the surface soil layer that thaws and refreezes each year). Within thermokarst, we further differentiate between the effects of thermokarst in lowland areas vs. that on hillslopes. For almost all of the processes that we explore, the effects of thaw vary regionally, and between lake and stream systems. Much of this regional variation is caused by differences in ground ice content, topography, soil type, and permafrost coverage. Together, these modifying factors determine (i) the degree to which permafrost thaw manifests as thermokarst, (ii) whether thermokarst leads to slumping or the formation of thermokarst lakes, and (iii) the manner in which constituent delivery to freshwater systems is altered by thaw. Differences in thaw-enabled constituent delivery can be considerable, with these modifying factors determining, for example, the balance between delivery of particulate vs. dissolved constituents, and inorganic vs. organic materials. Changes in the composition of thaw-impacted waters, coupled with changes in lake morphology, can strongly affect the physical and optical properties of thermokarst lakes. The ecology of thaw-impacted lakes and streams is also likely to change; these systems have unique microbiological communities, and show differences in respiration, primary production, and food web structure that are largely driven by differences in sediment, dissolved organic matter, and nutrient delivery. The degree to which thaw enables the delivery of dissolved vs. particulate organic matter, coupled with the composition of that organic matter and the morphology and stratification characteristics of recipient systems will play an important role in determining the balance between the release of organic matter as greenhouse gases (CO2 and CH4), its burial in sediments, and its loss downstream. The magnitude of thaw impacts on northern aquatic ecosystems is increasing, as is the prevalence of thaw-impacted lakes and streams. There is therefore an urgent need to quantify how permafrost thaw is affecting aquatic ecosystems across diverse Arctic landscapes, and the implications of this change for further climate warming. How to cite: Vonk, J. E., Tank, S. E., Bowden, W. B., Laurion, I., Vincent, W. F., Alekseychik, P., Amyot, M., Billet, M. F., Canário, J., Cory, R. M., Deshpande, B. N., Helbig, M., Jammet, M., Karlsson, J., Larouche, J., MacMillan, G., Rautio, M., Walter Anthony, K. M., and Wickland, K. P.: Reviews and syntheses: Effects of permafrost thaw on Arctic aquatic ecosystems, Biogeosciences, 12, 7129-7167, https://doi.org/10.5194/bg-12-7129-2015, 2015. 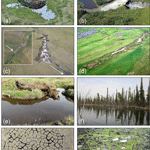 In this review, we give an overview of the current state of knowledge regarding how permafrost thaw affects aquatic systems. We describe the general impacts of thaw on aquatic ecosystems, pathways of organic matter and contaminant release and degradation, resulting emissions and burial, and effects on ecosystem structure and functioning. We conclude with an overview of potential climate effects and recommendations for future research.